Women on Boards 2016 Report Recognizes Urban Outfitters, Inc.
Urban Outfitters, Inc. is recognized as a company that has 25 percent or more women on its board by the Women on Boards 2016 Report conducted by The Forum of Executive Women and PwC. Girls ages 12-17 from Girls Inc. visited Free People to learn more about possible career paths and hear from Free People employees as they begin thinking about possible careers. URBN's annual ACHIEVEability backpack donation drive was another success this year with employees donating 316 backpacks, which will help children who are getting ready to go back to school in the Philadelphia region. As part of its "Cool Offices" series, the Philadelphia Business Journal profiled URBN's HQ at the Navy Yard. This year, URBN celebrated 10 years at the Navy Yard, marking the upcoming milestone in September. To recognize a decade at the yard, the theme of the party was inspired by Alice and Wonderland’s “Through the Looking Glass." The 11th annual Great Chefs Event brought together more than a thousand guests and a number of celebrity chefs to benefit Alex's Lemonade Stand Foundation for Childhood Cancer and the Vetri Community Partnership, a local organization that seeks to empower families to lead healthier lives through fresh food. Green Philly Blogger, Julie Hancher, recaps her Earth Day workshop held at the URBN Navy Yard campus as part of the week-long events celebrating Earth Week. Women's Wear Daily recently conducted a survey to answer a simple question: What is the most desired company to work for in fashion? URBN was named among the top 25 companies that made the cut. Urban Outfitters, Inc. (NASDAQ:URBN), a leading lifestyle specialty retail company operating under the Anthropologie, Bhldn, Free People, Terrain and Urban Outfitters brands, today announced the promotion of Trish Donnelly to CEO, Urban Outfitters Group. 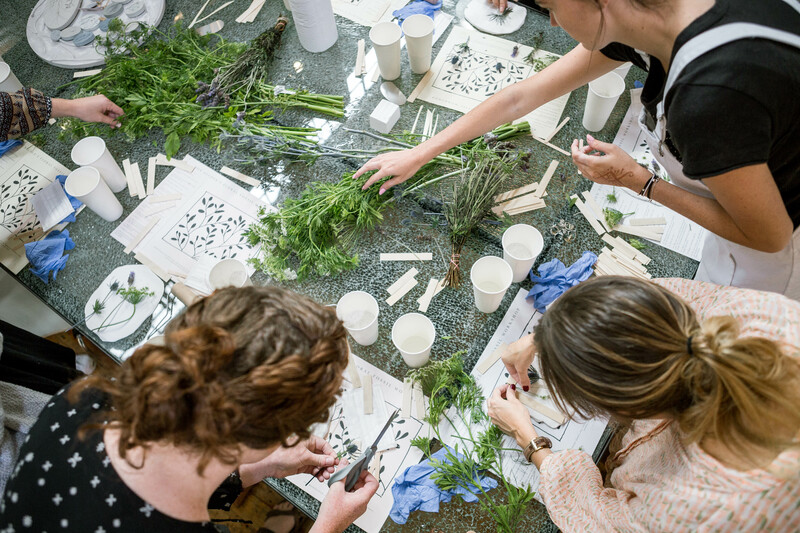 Employees celebrated the first week of March by learning how to make beautiful, swoon-worthy floral hairpieces with THE FLWRY – Philadelphia’s first floral subscription service. Urban Outfitters, Inc. (NASDAQ:URBN), a leading lifestyle specialty retail company operating under the Anthropologie, Bhldn, Free People, Terrain and Urban Outfitters brands, today announced the promotion of David McCreight to President, Urban Outfitters, Inc. ("URBN"). URBN took part in Operation Brotherly Love Holiday Carnival and Rally, a community event that provides thousands of Philadelphia-based children in need a very special afternoon of carnival games, dancing, entertainment, gifts, food and fun.